I finally made the big Costco trip last week. And would you believe I was in and out in 35 minutes? It was Monday, Dec 15 about 5:45 to 6:15ish. I thought it would be packed and was so thankful for no waiting! 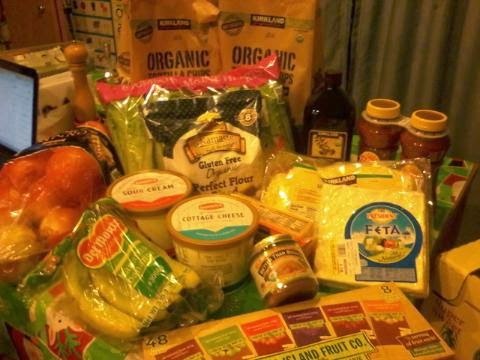 I spent $103.62 on: onions, bananas, lettuce, organic gluten free flour, feta cheese, mozzarella cheese, salsa, organic olive oil, organic chicken base, sour cream, cottage cheese, fruit leather, 2# block of cheddar, and 2 bags of organic tortilla chips. It was a good haul. On Tuesday I popped into Albertsons to get chocolate chips. 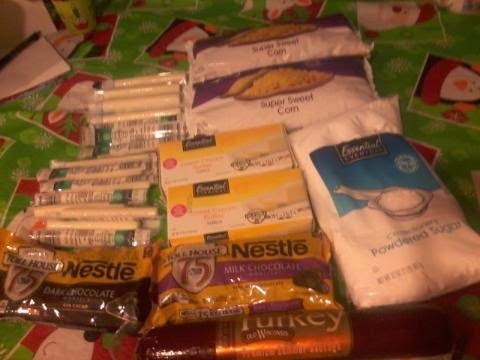 They also had butter on sale and string cheese on sale. 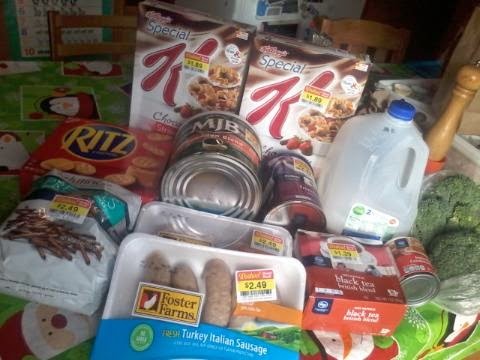 I spent $25.89 and also got powdered sugar, frozen corn, a sausage roll, and a dozen markdown donuts (not pictured). On Wednesday I was at Costco again to buy a group gift and ended up getting more lettuce and the garlic I couldn't find on Monday. It was gloriously Not Busy again and I spent $9.88 on food. Finally, I went to Fred Meyer early Saturday morning to help a kiddo pick out Christmas gifts for her siblings. We found some great clearance items and I am winging it here on the amounts because the receipt is in the car on this stormy night and I am in my PJs. The cereal was $1.89/box and I had a MC, but I swear the grouchy lady behind me in line stole it. My kiddo struggles with social niceties and happened to zip across this lady's path as she was entering the line behind us. Wow, did she give me a look. I had the coupon near the end of the conveyor and as I hustled my kiddo in front of me (aka. away from the meanie) the coupon disappeared. A search of the floor didn't turn it up and I was avoiding eye contact so didn't ask the annoyed lady. Anyway the cereal was $1.89 per box, no coupon, the milk was $5.29, the broccoli was about $2.00, a can of sweetened, condensed milk was a ridiculous $1.89, small coffee was $2.49 and bigger coffee was $3.49. Turkey sausages were $2.49 each, as well as the glutino pretzels. Ritz were $1.67 and clearance black tea was $1.39. The food was $27.80 give or take. I am really sorry for the poor quality photos, folks. Our camera jack broke a few weeks back so we bought a replacement of a similar model. Unfortunately the camera charger for the old camera is not charging the new one (gah!) so I'm using the camera in my moderately clever phone until that new charger arrives.